Rediff.com » Movies » Sherlyn Chopra to sizzle at Cannes? Sherlyn Chopra to sizzle at Cannes? According to the latest buzz, starlet Sherlyn Chopra will be seen at walking the red carpet at the 66th Cannes Film Festival in May, with director Rupesh Paul. The two will promote their upcoming film Kama Sutra 3D at the festival. 'Sherlyn Chopra to attend Cannes Film Fest to promote Kamasutra 3D,' Chopra tweeted. They will also unveil the Kama Sutra Booth, a new poster and trailer of the film at the Cannes Film Festival. We wonder what Chopra will be wearing to Cannes. 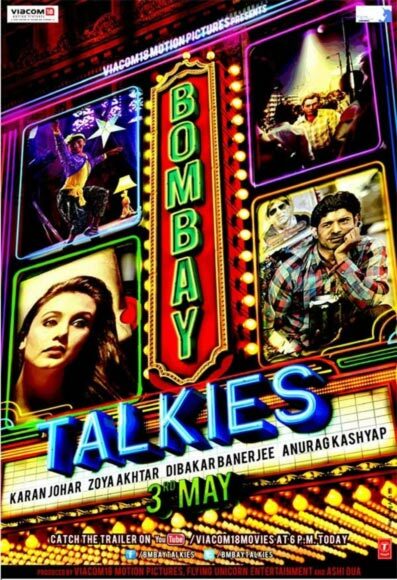 Some of the biggest movie names have come together for a song in the film, Bombay Talkies, which celebrates 100 years of Indian cinema. Choreographed by Vaibhavi Merchant, the song is titled Apna Bombay Talkies and will feature stars like Aamir Khan, Shah Rukh Khan and Saif Ali Khan, Kareena Kapoor, Vidya Balan, Rani Mukerji, Farhan Akhtar, Shahid Kapoor, Priyanka Chopra, Madhuri Dixit, Anil Kapoor, Sridevi, Akshay Kumar, Karisma Kapoor, Juhi Chawla, Ranveer Singh, Ranbir Kapoor, Imran Khan, Sonam Kapoor and Deepika Padukone. Some of the famous singers who have lent their voice to the song are Sunidhi Chauhan, Shaan, Sonu Nigam, KK, Kavita Krishnamoorthy, Kumar Sanu, SP Balasubramaniam, Abhijeet, Alka Yagnik, Mohit Chauhan, Sudhesh Bhosle, Shreya Ghosal, Shilpa Rao, Udit Narayan and Sukhwinder Singh. Dhanush's wife Aishwarya is floored by his Hindi! Tamil actor Dhanush's wife Aishwarya is impressed by his Hindi in the trailer of his debut Hindi film, Raanjhanaa. 'The trailer of Raanjhana is out !!! Omg I love it :-):-) check it out ...love my hindi talking @dhanushkraja,' she tweeted. Dhanush, who underwent training for fluency in Hindi language for the film, has dubbed for the role. Directed by Anand L. Rai, the film also features Sonam Kapoor, Abhay Deol and Swara Bhaskar.